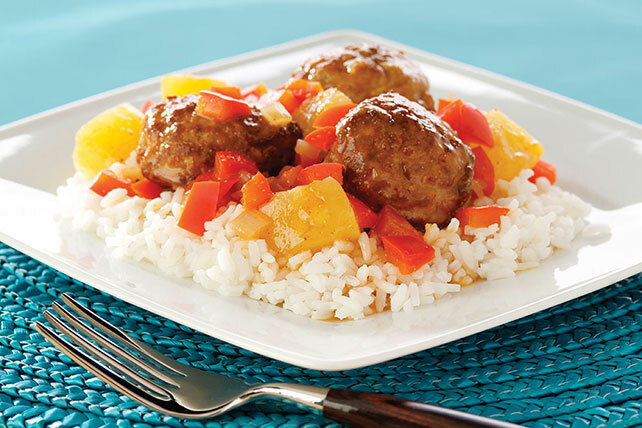 These sweet and savory glazed meatballs are sure to become everyone's new weeknight favorite! Heat oil in large skillet on medium-high heat. Add peppers and onions; cook 5 min. or until crisp-tender, stirring frequently. Stir in barbecue sauce, ginger, garlic powder and reserved pineapple liquid. Add meatballs; stir until evenly coated. Cook 10 min. or until meatballs are heated through, stirring occasionally. Meanwhile, cook rice as directed on package. Stir pineapple chunks into meatball mixture. Serve over rice. For a touch of citrus flavor, stir 1/2 tsp. orange zest into water in saucepan before using to cook the rice as directed. Prepare using 1 cup long-grain white rice, cooked as directed on the package.